Last month I had a fabulous day at the olive harvest at 'Currawong' a property here in the Southern ﻿Highlands. You may remember the story from last year that I had on my blog showing the beautiful gardens on this lovely old farm. ..... and there is some exciting news for those looking for somewhere lovely to stay when visiting the Highlands, Currawong now has the garden cottage available for accommodation. I was at Currawong photographing the cottage for their new brochure and I asked Al and Lyn Bailey, the owners of Currawong to let me know when they were harvesting so I could come up to see. I was so surprised to see how the olives are taken off the tree with long motorised prongs that shake the branches without harming the tree. Al and Lyn grow their olives for their award winning Currawong olive oil. I was expecting to see big plump olives but they were actually quite little as they pick them young for the oil and not for eating, they also pick them early before the birds come and take off with them. There were many beautiful large black cockatoos flying around this day, I'm sure they were attracted by the shaking of the trees. 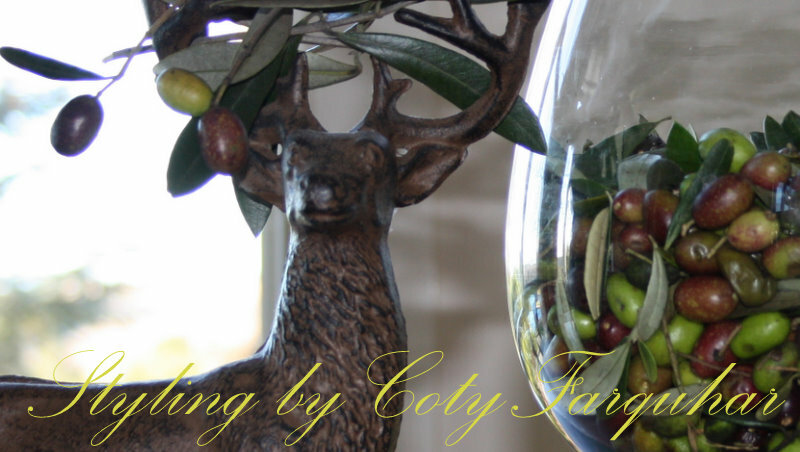 Lyn had been baking that morning some beautiful breads and with a huge bunch of olive branches, a basket of olives I planned a table scape for my favourite weekly blog gathering, Table scape Thursday in their gorgeous home. I raided Lyn's pantry for glass bowls, the large bowls normally used for salad I filled with the olives, little glass vases I filled with their oil and another for the branches. Whilst Lyn took off to pick up her teenagers from school I styled and photographed this setting. She had these two adorable reindeers sitting on her fireplace and I couldn't resist dressing up their antlers with olive branches for the centre of the table. Please do let me know if you also have a wonderful harvest or something special coming up and I would love to come and do a story, that's of course if you're near by!! As you can see it's winter here at the moment,it's very cold and it's blowing a gale outside, but it is a great time of the year to be out in it. The school holidays start today for Bec, my daughter and she has a three week break. This is the time of the year when everyone heads to the snow, but we will be staying here in the Highlands as many friends are coming down. I will also have my shop open some days over the holidays as we get so many visitors to the Southern Highland through winter on their way south to the snowfields. I also have my cameras on the ready for the possibility of snow this year, I am wishing for some snow filled pages for the Garden book I am working on. Lyn and Al Bailey below at their harvest at Currawong. photographing Dave, is this a sign for me? or are these truly blessed olives. Thank you to everyone who left me such amazing wishes for my B/day and also for the caring notes and emails regarding my sick family members. You are all so special, so caring and I am so fortunate to have you choose to link in with me and my blog. Wishing you a wonderful week. Oh, you are talented! These images take me away with you! Thank you Sanghamitra, I'm on my way over to visit you! Thanks Yvonne, you too!! I love your settings, they are so beautiful. You have such talent. You make olive branches look absolutely gorgeous. I always love everything olive related...but that sun-filled shot is so ethereal and magical! I love it! Wow amazing pics. Feel like an olive right now...Am so goning to plant two olives in pots...long time overdue on my "To do"list! Love your blog am new and happily stumbling on all the loviliness! and....thank you lanakwaustin, I love that shot too, I couldn't believe it when I first saw. What a wonderful post! Thank you for taking us alog with you. It has been pure olive pleasure! Beutiful pictures..you are so talented! Great pics! Love the last one. Thanks for taking Beach Cottage Good Life Wednesdays on a lovely tour. Stunning images Coty a beautiful spot indeed!